Need to Learn How to Write a Precis? If you are one of those desperate students who does not know how to write a precis, keep reading our article. We assure you that here you will find the information that will help you improve your writing skills and get the excellent grades. The life of an average student can be full of fun and adventures until he or she realizes that there are a lot of assignments to do and coping with all of them can take much time. Some students are very motivated and possess dedication towards the study while others what to spend their free time on having fun. If you belong to the second group, you should not be sorry. There is nothing wrong if you just want to enjoy your life. However, if you take care of your academic reputation, you should not neglect your grades. 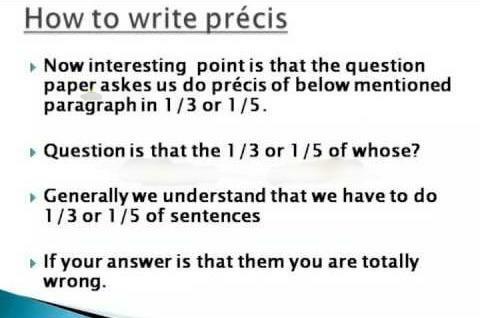 When it comes to academic writing, the students admit that writing a précis is one of the most difficult assignments. Though it is very short, it causes many problems for the students, who cannot express their thoughts in a short manner. If you want to know better what is a precis, just keep reading and our guide will help you understand the essentials of this task. Indeed, there are several precis meanings, however, you need to learn the one that deals with summarizing some text. A common definition of precis says that it is a concise synopsis of the scholarly work, an article, or a dissertation. In other words, a précis is a summary, but it deals with not only paraphrasing the text. Having the French roots, this word means, “cut brief” or “precise.” In comparison with the simple summary, in which the author should cover everything, a précis usually focuses on the most important parts of the work, its core. As such, précis always has a certain structure. Noteworthy, one can say that précis is an objective view on a particular work which implies the in-depth analysis of the ideas and messages stated by the author. At the same time, precis writing does not require personal opinion and a precise writer should me maximally unbiased when analyzing someone`s work. To write a good precis, you have to follow a well-structured rhetorical precis template that will outline all your steps. Undoubtedly, to create a good precis, you need to understand its key features. So, let us check them out! First and foremost, when writing your precis, you should not copy-paste the sentences from the original work but paraphrase the most interesting ideas. The text should be clear, precise, and concise. The precis should have a good title. It should not contain any meaningless details. If you want to facilitate the process of writing, you need to create a good rhetorical precis outline. It is a short plan of your essay that is composed after the thorough reading of the work. Your outline will define the key steps and ideas that will be mentioned in the precis. We assure you that this map will help you focus on the meaningful elements of the work summarized skipping the meaningless ones. Let us briefly explain the essentials of the rhetorical precis format. First, you have to tell the name of the author. Second, you have to use one of the following rhetorically accurate verbs: states, claims, asserts, admits, argues, etc. In other words, you have to explain what is the main purpose of the work you summarize. Furthermore, consider answering the following questions: what goal does the author pursue? what methods does he or she use to reach his goal? What is his/her target audience? We assure you that by explaining properly the relationship between the writer and his/her audience you will get a few additional points. Indeed, the authors rarely tell about their intended audience, so you need to think carefully and define it taking into consideration the language of work, the author`s tone, the references used, as well as any other significant information about the author. Undoubtedly, a rhetorical precis definition can give some understanding of this assignment. However, to write it well, you have to look at the successful precis examples. As such, if you have no idea how to write a rhetorical precis, you can ask your professor for assistance and he/she will provide you with a few effective rhetorical precis papers. Alternatively, you can find some free samples available on the web and learn how a good rhetorical precis should look like. Reading these samples, you will understand what is a rhetorical precis, and how to create a good precis essay. Beware of copy-pasting anything from the pre-written samples since it will lead to the negative consequences in our educational institution because of the plagiarism accuse. When it comes to writing the body paragraphs, it should be noted that each paragraph should summarize a separate section of the text analyzed. In this part, the writer is free to use evidence to support his/her arguments. However, there should be no long quotations that take a major part of the work. If used, all quotes should be meaningful, relevant, and brief. Moreover, all of them should be cited carefully in accordance with the formatting style mentioned in instruction. A conclusion is a final and equally important part of the essay. Ideally, it summarizes all the important points mentioned previously and does not introduce new details. Besides, a good conclusion always points out to the relevance of this particular work. The length of the conclusion depends on the overall length of the precis. We assure you that finding a creative hook you will be able to engage the reader and make him/her read the whole precis. Moreover, to write a good precis, you need to read the original work several times. Keep in mind that reading it only once, you will not be able to catch the most important details. So, to achieve a good result, you need to read the text thoroughly many times taking notes of every idea or thought that seems interesting to you. The number of times you need to read the work depends on how clear or unclear for you is the information discussed in the work. Each time you reread the text, be sure to compare it with your previous notes and summaries that were already written, including the summaries of the main sections and the summary of a thesis statement. Make sure your current explanations of the text match your previous understanding. We assure you that reading the text until you feel comfortable with understanding the author`s messages, you will be able to write a great precis. If you are trying to understand how to start a summary paper, we assure you that you have to read the text for analysis very carefully. Moreover, before reading the text, skim through it. Try to divide it mentally into several sections based on the shifts in discussion, headings, and subheadings. This will help you understand how to write a summary paragraph separately. If you notice some unknown terms, do not hesitate to look into the dictionary for their meaning. If you need to read some articles in the encyclopedia to understand the concepts discussed in the work better, feel free to do it. After skimming, when reading the work more carefully, pay attention to the details that look too interesting or too confusing. Before progressing further, you need to clarify the confusing points. When writing, you need to avoid detailed concentration on the specific points. How many sentences are in a summary? Remember that your precis statements should be clear and concise. Each section of the work should be summarized separately. Try to put a summary of each section into one-two meaningful sentences. However, these sentences should include the reasonable pieces of evidence. You should try to avoid mentioning the minor details even though they seem very interesting to you. After summarizing each section, there should be no need to return to the text itself. Such a method will help you reproduce the key ideas mentioned in the text in your own words. How to begin a summary? Restate the thesis. Identify whether the author states it directly or indirectly. Rewrite the thesis in your words but do not try to change its meaning. The summary sentences that go further should explain or clarify the thesis. A good thesis statement encompasses the author’s key ideas and gives a clear understanding of what the original work conveys overall. When working with the author’s thesis, try to determine his/her purpose. What argument does the author make and what evidence help him/her support these arguments? Write a few words about the author’s purpose in a separate sentence. We assure you that you have to dedicate maximum attention to every precis paragraph. When writing a precis, separate a thesis statement and summaries of the key sections. We assure you that following the basic precis outline described in this article, you will be able to achieve the unbelievable result. If you managed to create a perfect thesis statement, feel free to include it word-for-word in your precis. When the precis is written, do not forget to review it several times and revise if necessary. Keep in mind that it should clearly express the original meaning of the work, as well as retain basic tone of the original text. Besides, make sure your precis follows the classic precis structure. To get the highest grade, your writing must be coherent, accurate, and grammatically correct. Read carefully the instructions checking the length required. Usually, the length of precis varies between 100 and 200 words. Although this task is comparatively short, the process of its writing is quite challenging and not every student can cope with it successfully. When writing precis of this length, it is better to use the conclusionfour-sentence structure discussed in this article. Sometimes, the professor may ask you to write a longer summary in the form of precis. If you have to do that, first and foremost, ask your professor about the required length. Keep in mind that precis is the assignment that checks the student ability to state his/her thoughts in a concise manner. That is why you should not exceed the length required since it will reduce your chances to get the desired grade. When writing a longer precis, you also need to follow the common structure extending every sentence to a short meaningful paragraph. In your concluding paragraph, restate the thesis statement along with one sentence evidence supporting it. A longer precis usually requires one or even two pages. Your precis should be composed in the present tense and follow it throughout all paragraphs. Besides, writing requires active voice instead of the passive one. When writing a precis, you should avoid direct quotations. You have to summarize the original text in your own words. Only in rare cases, you have to quote the specific terms. If you cannot avoid direct quoting, make sure to do it in accordance with the required formatting style (APA, AMA, MLA, Chicago, or any other). In conclusion, we should say that writing a precis is quite a challenging task that requires much time and efforts. To write a good precis, you need to understand the text well and be able to explain the author`s key ideas and messages. Besides, you have to follow a classic precis format and pay attention to all details. However, at the same time, this task helps improve the analytical and critical thinking skills that are particularly important in any workplace. Besides, it helps express the opinions more clearly, which is necessary for the development of persuasive skills.